Anthony Steffen is Ringo in this minor Spaghetti Western with a decent storyline. German R2 X-rated Kult DVD. 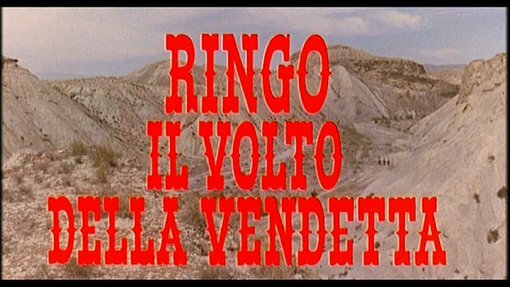 Ringo, Face of Revenge is a very minor chapter in Spaghetti Western history - its adventure movie storyline is a hark back to the American Westerns and none of the politics and gritty or comic tones of the later European Westerns are here, it is a simply told story. Fortunately the plot is strong enough to keep the film rolling and the constant scheming keeps the audience on their toes with some unexpected twists. There are a few plot holes, but generally the film makes sense and builds up to a good climax. Direction is rather generic but does the job well and there is a forgettable soundtrack from Francesco De Masi. Anthony Steffen is suitably cast as Ringo with Frank Wolff giving a strong performance as the slimy Trikie. Eduardo Fajardo is cast very much against type compared to his best known role as Major Jackson in Django (1966) and is almost unrecognisable as Ringo's loyal friend, Tim. Ultimately an interesting, well written film, and suitable entertainment for a Spaghetti Western fan, but nothing new or exciting here, and certainly not a recommended place for genre newcomers. Partly recommended. Anyone famous in it? Anthony Steffen - a frequent Spaghetti Western star who also starred in Some Dollars for Django (1966). Mario Caiano - a lesser known European director who also shot Spaghetti Westerns My Name Is Shanghai Joe (1972) and Train for Durango (1967). Spaghetti Western fans should enjoy, but not for newcomers to the genre. A generally good print, although some noticable grain and print damage (heaviest during the opening credits). Audio English, Italian and German mono. English and German sound good, Italian is a little muffled. Original German and Austrian Theatrical trailers. German and American title scenes. Still photo gallery (as video file, with soundtrack cue). Cuts? Believed to be fully uncut. Print has Italian credits. A minor Spaghetti Western with an interesting storyline but rather unimpressive direction. Partly recommended. The DVD has a decent print and fine English soundtrack, for such an obscure SW title, this unlikely to be bettered. All text in this review written by Timothy Young - 17th December 2006.